Wm. Masters, Inc.: Air Conditioning "Tip of the week"
In the summer time, the air conditioner uses the blower portion of your furnace to distribute air throughout your home - Help your furnace to breath easy and work effectively by cleaning or replacing the return air filters every month! 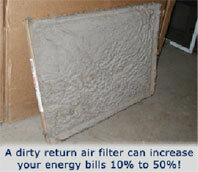 A dirty filter in the summer time can cause an air conditioner to "ice up"! A good way to remember to change the filter is to do it every time you get your electric bill.